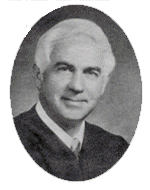 Of all Hamilton County’s sheriffs, Judge Robert Summitt’s tenure was the shortest and most unusual. 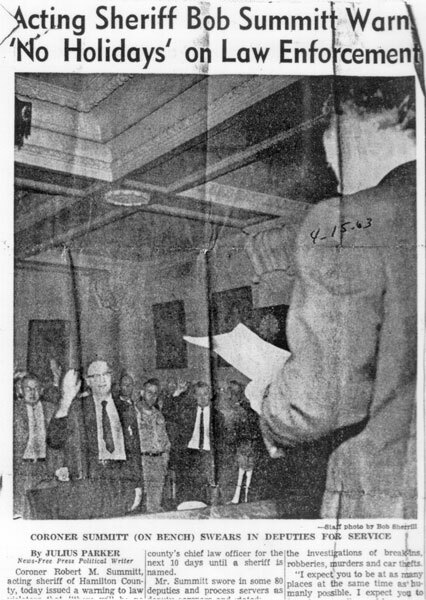 Summitt served as assistant county attorney and a Hamilton County coroner for ten years before being summoned by the county court to complete Sheriff James “Bookie” Turner’s last term of office. 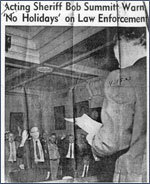 Turner had won the election for Chattanooga Fire and Police Commissioner and was unable to finish the last days of his term as sheriff. Summitt’s first duty was to swear all the sheriff’s deputies in as assistant coroners. He brought his two top aides, Robert Lahiere and John Fry, with him to the sheriff’s department. Recalling the turn of events during his fifteen days in office, Summitt remembers wanting to make sure that a low profile was kept within the department. Unfortunately, this was not to be. Soon after he was instated as sheriff, a fire broke out in the Detective's Office. Not long afterward, a woman murdered her husband at the Soddy Daisy American Legion. “It was one thing after another,” Summitt said. There were, however, some enjoyable moments like riding his four children around in the sheriff’s car and taking a tour through the historical gallows and tunnel of the old jail.